The Reverse Trade Show is an opportunity for Industry Partners to get face time with some of the biggest decision makers in the local Property Management industry. Unlike traditional trade shows, the Property Management Companies run the booths while the Industry Partners circle the floor. Each Industry Partner pair gets 4 minutes to introduce their company and products before moving on to the next table. 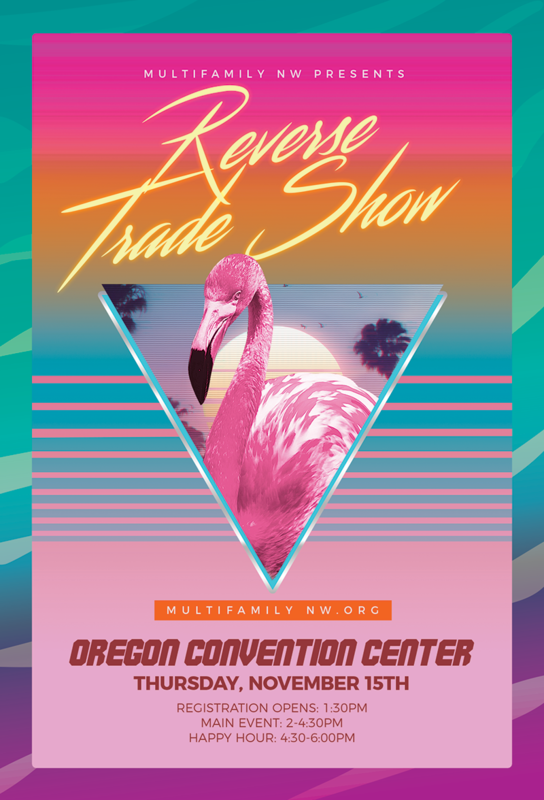 The Reverse Trade Show is unique among Multifamily NW’s annual offerings. Not only is it the only event with guaranteed face time with Property Management Companies, but it is also our only event directly benefitting Multifamily NW’s legislative efforts. Each year, proceeds from the Reverse Trade Show are donated to the Defense Fund. The Reverse Trade Show is a members-only benefit and a way to bring members together. Property Management Companies (PMC) attend at no cost with unlimited representatives. Industry Partners (IP) pay a fee of $400 per pair of representatives with a maximum of 2 pairs allowed per company. These restrictions are strictly enforced to ensure a proper ratio of PMCs to IPs.